b. Youth bowlers who enter any portion of this tournament may not participate in the 2018 State Candlepin Youth Championships. a. 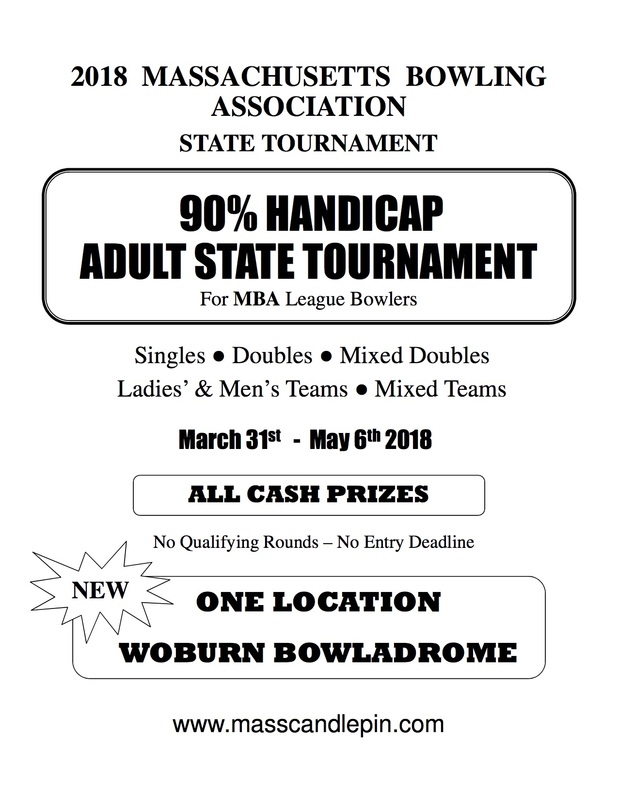 All handicap bowlers entering any adult event must file by mail for an average card with MBA, PO BOX 8068, LYNN, MA 01904. FILE EARLY. or initialed averages will be rejected. Once your info is complete, get appropriate signatures. Make checks payable to MBA Tournament. 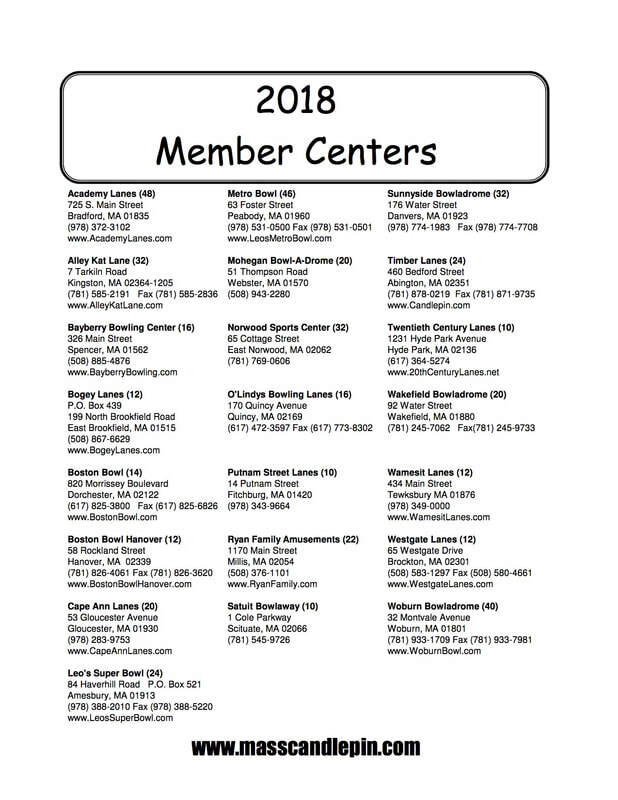 2018 to February 14, 2019 and a coupon good for 5 Free Strings of Open Play Bowling valid to December 31, 2018. Both cards will be honored at any MBA. Bowlers are required to present their identification cards for every event. No card on file - No entry. Photo ID may be required at finals. d. All entrants must have verified MBA LEAGUE averages (at least 40 strings) in an MBA establishment. TRUE Average from 2,3,4,5 or 6 person teams shall be used in determining the highest average. If during the season, you have bowled with temporary injuries or physical circumstances that decrease your average, it will be reviewed by the Tournament Directors and subject to adjustment. 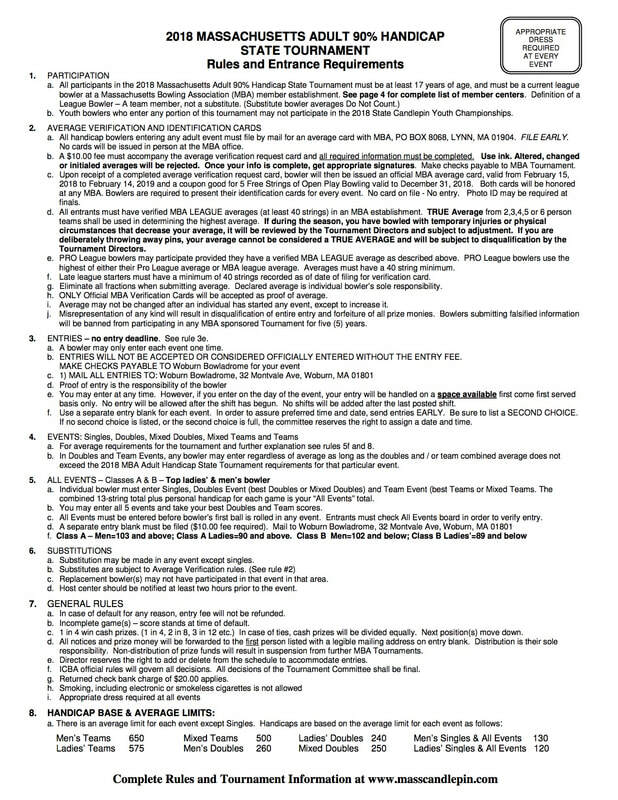 If you are deliberately throwing away pins, your average cannot be considered a TRUE AVERAGE and will be subject to disqualification by the Tournament Directors. e. PRO League bowlers may participate provided they have a verified MBA LEAGUE average as described above. PRO League bowlers use the highest of either their Pro League average or MBA league average. Averages must have a 40 string minimum. f. Late league starters must have a minimum of 40 strings recorded as of date of filing for verification card. g. Eliminate all fractions when submitting average. Declared average is individual bowler’s sole responsibility. h. ONLY Official MBA Verification Cards will be accepted as proof of average. i. Average may not be changed after an individual has started any event, except to increase it. j. Misrepresentation of any kind will result in disqualification of entire entry and forfeiture of all prize monies. Bowlers submitting falsified information will be banned from participating in any MBA sponsored Tournament for five (5) years. 3. ENTRIES – no entry deadline. See rule 3e. a. A bowler may only enter each event one time. b. ENTRIES WILL NOT BE ACCEPTED OR CONSIDERED OFFICIALLY ENTERED WITHOUT THE ENTRY FEE. f. Use a separate entry blank for each event. In order to assure preferred time and date, send entries EARLY. Be sure to list a SECOND CHOICE. a. 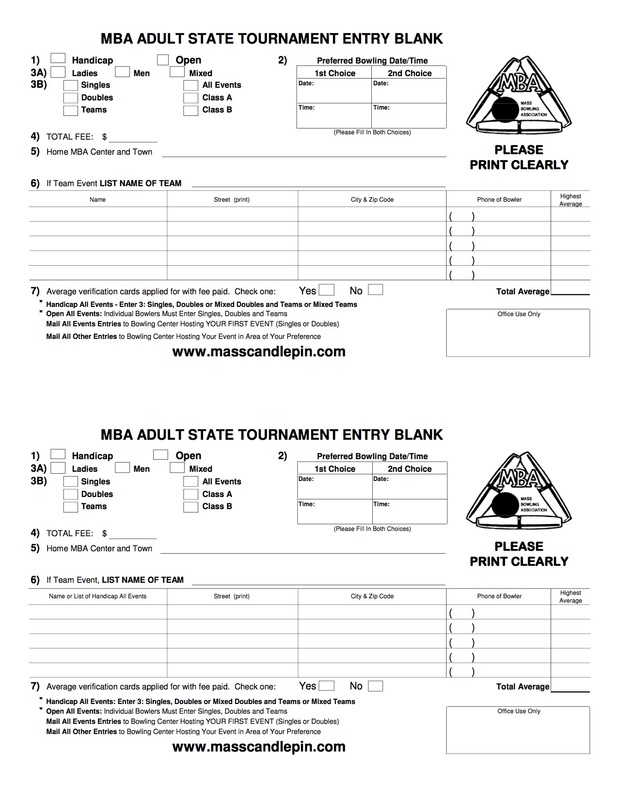 For average requirements for the tournament and further explanation see rules 5f and 8.
exceed the 2018 MBA Adult Handicap State Tournament requirements for that particular event. combined 13-string total plus personal handicap for each game is your “All Events” total. b. You may enter all 5 events and take your best Doubles and Team scores. 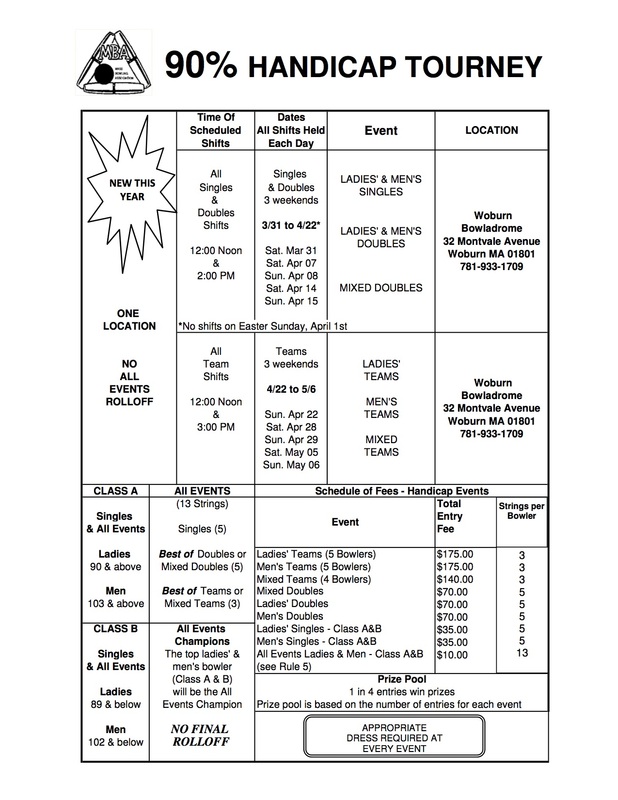 c. All Events must be entered before bowler’s first ball is rolled in any event. Entrants must check All Events board in order to verify entry. a. Substitution may be made in any event except singles. c. Replacement bowler(s) may not have participated in that event in that area. d. Host center should be notified at least two hours prior to the event. a. In case of default for any reason, entry fee will not be refunded. b. Incomplete game(s) – score stands at time of default. c. 1 in 4 win cash prizes. (1 in 4, 2 in 8, 3 in 12 etc.) In case of ties, cash prizes will be divided equally. Next position(s) move down. d. All notices and prize money will be forwarded to the first person listed with a legible mailing address on entry blank. Distribution is their sole responsibility. Non-distribution of prize funds will result in suspension from further MBA Tournaments. e. Director reserves the right to add or delete from the schedule to accommodate entries. f. ICBA official rules will govern all decisions. All decisions of the Tournament Committee shall be final. g. Returned check bank charge of $20.00 applies.